Thank you for visiting our Terminology page. To help you better understand the terminology used with index tabs, we offer a FREE "Terminology Glossary and Color Guide." Simply click on the illustration to the left and a Terminology Order Form will be displayed. 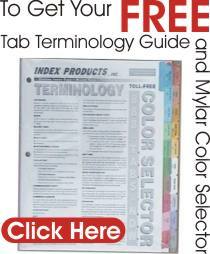 Complete the form and we will gladly send you our Terminology Guide / Mylar Color Selector. see the available colors on-line. Artwork is normally supplied for body copy only. It can be supplied as reflective artwork or as an electronic file. On the PC we prefer Corel files and on the Mac we prefer QuarkXPress. NOTE: We typeset the tabs at no charge. A bank of tabs is a complete row of same size tabs running the length of the face edge. The face edge is normally the 11" edge. A tab that has no printing. Blank tabs can be ordered, then inventoried at your location for imprinting on your copier on-demand. Body copy is any printing on the tabs sheet other than on the tab extension. The body size of an index tab sheet is normally 8�"x11". It is the dimensions of the tab sheet without the tab. The overall size of an index tab sheet is normally 9"x11". It is the dimensions of the tab sheet with the tab. (1) Straight Sequence  This is a 1,2,3,4,5,1,2,3,4,5 repeating order of tabs. (2) Reverse Sequence  This is a 5,4,3,2,1,5,4,3,2,1 repeating order of tabs. (3) Double Reverse Sequence  This a 5,5,4,4,3,3,2,2,1,1 repeating order of tabs. This is printing that repeats in exactly the same place on the body of each tab. It can be a company logo, a part number or anything that repeats on each tab. See Different Body Copy. On high-volume tab jobs the most economical form of shipment is trucking companies. We have very good rates with the trucking companies we work with. Don't let distance keep you from placing your largest orders with us. The cut is the number of tabs in a bank. For example a 5th cut tab would have 5 tabs in a bank. Any index tab that includes our printing and die-cutting capabilities. Customer supplied inserts are typically marketing materials that are pre-printed, such as product sheets, 4 page catalogs, 8 page catalogs, 16 page manuals, etc.. We can collate these into your looseleaf documents automatically. This saves time and money over inserting these by hand. The critical factor is the insert must have one bound edge. The process of trimming the tab extension out of the overall size tab sheet. This is printing on the body of the tab that varies from tab sheet to tab sheet. As an example: The tabs may have each distinct tab title printed on the body of each tab sheet. See Common Body Copy. (1) The number of holes  This is normally 3-holes, and sometimes 2-holes but it can be up to 7-holes. (3) The diameter of the holes  This is normally 5/16". Drytime is the amount of time it takes the ink to dry prior to lamination and tab cutting. Due to the combination of heat and pressure associated with the lamination process, the dry time on body copy projects is extended. The normal turnaround time on index tabs that have body copy is 10 calendar days from the date of final proof approval. This a 9/16" strip of mylar laminated to the back side of the binding edge of the sheet. It is used to strengthen the sheet. Applying edge reinforcing to the tab sheet will minimize the probability a tab will be torn off the rings. This is a wise investment if the tabs are going to be used frequently. The tab extension is the length the tab extends out from the body of the sheet. The standard tab extension is 1/2". This means a standard tab sheet with a body-size 8�" x 11" and a �" extension will always have an overall-size of 9" x 11". The processes involved in the transformation of a press sheet that has been trimmed to the overall-size into an index tab. Finishing includes any combination of the following processes: lamination of tab mylar to the sheet; the process on tab cutting; the process on edge reinforcing; dilling; collating and shrink-wrapping. A formulation of ink that drys harder than normal ink. It is used to print body copy on coated stock only when there is no lamination. This means you use hard-dry ink on plain tabs only. This is our specialty. These are projects that run on our web presses for several days. The turn-around time and other logistics are researched by our customer service team to meet your needs. The indent measures the distance from the top of the tab to where the top tab starts, or conversely, the measure from where the bottom tab ends to the bottom of the sheet. Index tabs are manufactured using a lamination process involving high heat. Consequently, the ink used is specially formulated to withstand the heat. This ink is called Laser-Sub ink. It is available in black and PMS colors. IP-100 is our standard tab stock. It is a white 100# Tag Board with a micrometer reading of approximately .0073". IP-125 is our heavy tab stock. It is a white 125# Tag Board with a micrometer reading of approximately .0093". IMPRINTABLE TABS Our trademarked product line of quality Blank Plain Paper Index Tabs for use on copiers. These are designed and packaged to arrive in perfect condition, even when shipped via UPS Ground or by other means. The text pages and tabs contained inside of a three-ring binder. A plastic film used to strengthen and provide a variety of colors to the tab extension. It is applied using high temperature and pressure. Ink on the body of the sheet must be completely dry before it can be laminated. Any PMS color except the following: PMS-Orange 021; PMS-Warm Red; Red 032; PMS-Purple; PMS-Violet; PMS-Blue 072; PMS-Reflex Blue; PMS-Process Blue and PMS-Green. The size of the sheet prior to tab cutting (i.e. the size of the body plus the tab extension) This is normally 9" x 11". Overs are additional sets produced due to efficiencies in the production process. An allowance for overs is considered normal when ordering tabs. We reserve the right to overship no more than 10% and bill accordingly. For exact quantities add 10% to your price. The price of one set of index tabs. For example: Suppose you have 5 tabs in a set. A $1.00 per set price represents the price of all five tabs with the set. In this example the price per tab would be $0.20. A tab that has no mylar laminated to the tab extension. The location of the tab within a bank of tabs. For example, the first tab in a 5th cut bank of tabs would be in the first position. The second tab would be in the 2nd position, etc. The process of imaging a sheet of paper using printing plates and ink. All our tabs are printed using laser-sub ink rather than toner in a reprographic process. This provides the finest quality tab available. A proof is a sheet of paper used to clearly communicate the specifications and tab layout. It is used to assure the tab project will be produced exactly the way you desire. Proofs are sent via fax for your review. Once the proof is reviewed you provide your signature indicating approval or a request for additional changes. It is at this point any changes needed can be performed free of charge. Tax certification for all tax-free sales in California. If appropriate we will fax the resale certificate at the time of proof. Reversed tab copy is white lettering "reversed out" from a solid PMS or black ink on the tab extension. Rush shipment is available on most tab projects at an additional charge. Our custom tab rush up-charges are as follows: 2 working days from proof approval add 20%; next day add 40%; same day call for availability. Weekends and Holidays are not considered working days. All the tabs contained in a single unit of your order. For example: if you have 5 tabs total, then the 5 tabs whether collated or uncollated make up a set. The standard PMS colors are as follows: PMS-Orange 021; PMS-Warm Red; Red 032; PMS-Purple; PMS-Violet; PMS-Blue 072; PMS-Reflex Blue; PMS-Process Blue and PMS-Green. Our standard turn around time is 5 to 7 working days from final proof approval. If a project has body copy and is to be laminated, the standard turn around time is 10 calendar days from proof approval. The typing of the tab titles in the desired typeface and point size, as well as the arrangement of the tab titles into perfect position for printing and tab cutting. Many of our shipments are sent via United Parcel Service. Working days are based from the time of proof approval; if proof is returned before 12 noon Pacific Time, the current day counts as a working day; if proof is returned after 12 noon Pacific Time, the current day is not considered to be available for production purposes and will not count as a working day. Weekends and Holidays are not considered working days.